Whilst the valley of Chamonix can be daunting with it’s incredibly steep mountain terrain, there are still plenty of easy family hikes to some incredible view points.Despite the last minute ditch by Winter to smother the valley white, the Spring sun is hotting up and all of the lower trails are now bright green & snow free. Prime for biking and hiking. The beauty of visiting in May is that it’s inter-season. Whilst other ski resorts shut down, Chamonix’s no ghost town in inter-season. Yes, the high altitude trails are still inaccessible and yes, the lifts are out of action until mid June, but May is the perfect month to visit to take advantage of rock bottom low season tariffs, share the streets with locals rather than tourists and explore the lower mountain trails. Glacier des Bossons is the easiest hike up to a glacier from the valley floor in Chamonix. In Summer you can even take a chairlift up to the buvette (snack restaurant) to get to the most amazing view (above). I’m recovering from my recent knee op, so sadly, the trails are out of bounds for me. 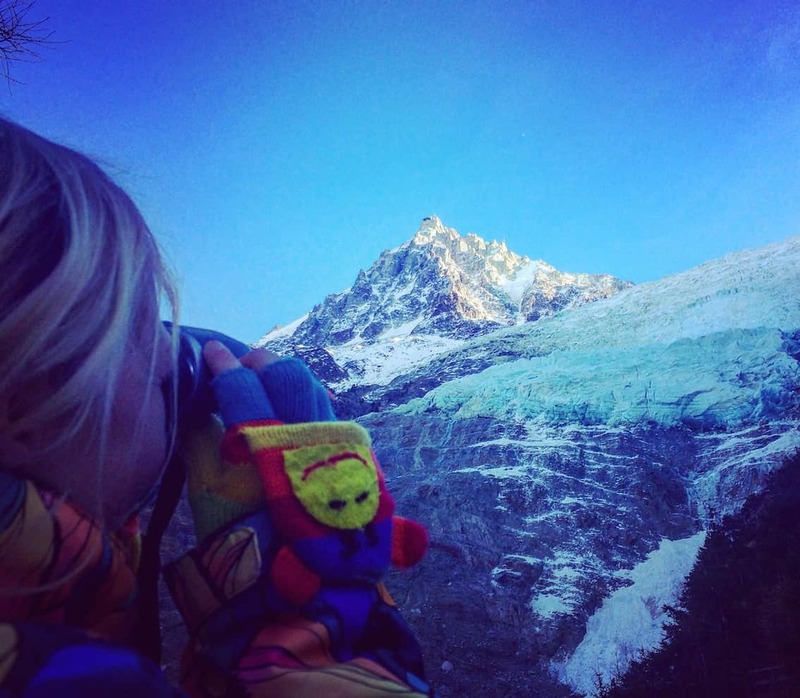 Today, I look back at one of the pretty amazing kid friendly trails we took in December up to Europe’s longest glacier at Les Bossons. We were ripe then with anticipation for the season ahead and eagerly waiting for the first snow dump. After teaching the girls about glaciers, how they work and why they are retreating, we hiked up to the Les Bossons glacier in Chamonix to see one up close and personal. Crunchy brown leaves – waiting for the snow to arrive. I love the brightness of the girl’s jackets against the autumnal shades of the landscape! Glacier des Bossons is an impressive hunk of ice descending from Mont Blanc. It’s impossible to miss on a visit to Chamonix. You drive right past it on the way in and out of the valley and I, without fail, always ponder it with awe. In the 17th century the glacier extended so far that it touched the village of Les Bossons and it’s said that bishops were called to exorcise the demons from the glacier.From Chamonix drive up through the village of Les Bossons to the tiny hamlet of Le Mont, nested in the glacier’s shadow. Park in the tiny car park & pick up the trail, clearly signposted. This side of the valley is north facing and gets no sun in December so wrap up warm if it’s early Winter. May though, it could be blazing sunshine, rain or even light snow! The trail is clearly defined and starts as an effortless climb through forest. The path does get steep higher up but it’s easy to navigate and my girls managed it easily. If you have very young children carry them in a back carrier as although the trail isn’t difficult, it’s not buggy terrain. You’ll pass through an annihilated section of forest. Felled trees scarring the landscape. My girls hate to see this and exclaim vehemently as we pass through as we discuss deforestation. They love the tiny cairns that decorate the trail and I have to remonstrate my 5 year old as she attempts to destroy them with her walking stick. You’ll pass underneath the stationary chair lift, lifeless between the trees. The lift operates in Summer whizzing tourists to the buvette (snack cafe) that we’re heading for 1 hour up the trail. Time your visit in peak Summer months if you aim to do any of the longer trails from here and take advantage of the chair lift up over the first part of the trail. It’s an independent family run chair lift that runs from mid June to mid September every year. An adult return costs €11.30 and a child return €8.40. There are reductions for groups of 10 or more people and families. Tickets can only be bought from the bottom of the list and not online. The trail is varied and will keep the interest of children as it winds steadily with dozens of switchbacks as we climb higher and higher. Halfway up the trail with 25 minutes further to climb. The trails are clearly marked by signposts with helpful approximate times to get there. The Chalet du Glacier des Bossons is the first stop on the trail. The infamous hike up to the famous Jonction (which is far as you can go) – a last bastion rocky outcrop before the ice wall starts a whacking 4hr 20 off. That’s definitely a Summer hike, one’s we can tick off on a later date when that chair lift is cranking, my knee fixed and solo without the kids. It takes us 1 hour to reach the Chalet du Glacier du Bosson (the buvette) which is, as expected, boarded up for Winter, but boasts a fabulous viewing platform of the entire valley and up to the magnificent Bosson Glacier. Rammed in Summer, we have it all to ourselves, the benefits of hiking out of season. Snaking down from the Aiguille du Midi (you can just make out the tiny telepherique docking at the top) the glacier is stunning. Looking up you can see the humongous wall of ice, sheer and jagged frozen onto the rocky terrain above. It’s a completely different view of from the bird’s eye perspective from the top of the Aiguille du Midi and it’s wonderful to contemplate it away from hoards of tourists. The glacier has been the site of two air crashes in the past century. The wreckage of two Air India flights, one in 1950 and the other in 1966, still turns up on occasion, being spat out from the bottom of the every receding glacier. Bits of wreckage can been seen at the Chalet du Glacier du Bosson which the girls found really interesting. We already know from looking up our facts on glaciers that the reason that glaciers looks so blue is that the ice is so dense. From our dark shady outcrop looking up at the pinnacle of rock lit up in sunshine and the fat tongue of ice slithering down we feel incredibly small and humble.This is a brilliant hike for families – not too long, varied terrain and lots of things to keep interest AND a magnificent glacier at the end! Have you visited glaciers with your kids? Which ones, and how were the hikes?